Brent Haddad. Photo by Tosh Tanaka. The new Center for Integrated Water Research (CIWR) at UC Santa Cruz will help cities and their surrounding regions address water issues in all their complexity. CIWR builds on a decade of research by Haddad and others and takes a practical approach to evaluating water policies. The first step is to assess the natural endowments of a region, including the presence of surface and groundwater, the amount and timing of rainfall, and the overall water quality. Second, the long-term health of these assets is evaluated. Researchers then review the economic and social needs, as well as the long-term goals, of a region before evaluating whether existing rules, mandates, and administrative bodies are helping or hindering the achievement of the region's goals. "This integrated and interdisciplinary approach allows us to generate policy and management recommendations that are tailored to help cities and regions achieve their specific goals," said Haddad. "If we know anything about water issues, it's that they defy a one-size-fits-all approach." 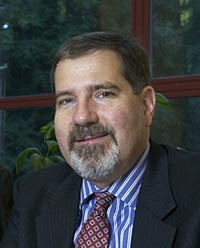 Haddad is a leading expert on water policy and management. The author of Rivers of Gold: Designing Markets to Allocate Water in California (Washington, D.C.: Island Press, 2000), he advocates a shift away from polarizing debates over water use toward an integrated approach that encompasses environmental, economic, and population needs. "Our goal is to help regions, states, and nations make good choices about water supply and water quality," he said. "We focus on applied problems and build theory out of specific cases." UCSC is the perfect campus to host the new center's interdisciplinary approach to water issues, said Sheldon Kamieniecki, dean of the Division of Social Sciences. "Today's water-supply issues revolve around the distribution of a limited resource," said Kamieniecki. "By learning from and sharing our expertise with water agencies, we will help ensure the development of sustainable systems that meet both societal and environmental needs." More information about CIWR is available on the project's web site.